The WISE Awards 2013 is a fantastic opportunity to recognise the successes of women in STEM, and this year there has been a record number of nominations across the ten categories. 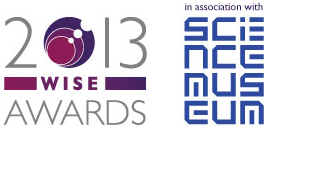 The WISE Awards 2013 will be held on the evening of 14 November, in the inspirational setting of the Science Museum itself. The winners will be announced and presented with their awards by WISE’s Royal Patron, HRH The Princess Royal. The WISE Campaign promotes female talent in science, technology, engineering, and mathematics fields, and is passionate about connecting young people with role models, promoting networking events, and providing unconscious bias training and consultancy across the UK. The WISE Awards developed from the previous “Women of Outstanding Achievement Award”, which began in 2006. Currently in its second year running, the WISE Awards 2013 is set to be the biggest celebration yet, with around 400 guests from a diverse range of STEM backgrounds in academia, business and media set to attend. In addition, this year the Media Award has been introduced to the 2013 WISE Awards. This award aims to celebrate the dedicated outreach of science communicators across a breadth of modern topics, alongside the Girl Award, for girls and young women who have demonstrated an exceptional potential within STEM in both their studies and their personal interests. Why are we supporting this event? HRS is a specialist recruitment company dedicated to the Science, Technology and Engineering sectors. Our vision is to provide recruitment solutions which will assist in the improvement and quality of life for all. We aim to provide a service to areas of actual need which have an impact on us all. In doing so we have a clear focus of further promoting and supporting the Science & Life Science sector whilst helping to retain key talent across the industry. Every day we are engaging with and providing career options to some of the world’s best talent, covering a broad range of skills. We treat each candidate as an individual to ensure that the role they are being considered for is right both for their career ambitions and for the specific business’ needs. Ricky Martin, Managing Director of HRS, is extremley passionate about HRS being known not just as a recruitment consultancy but a real part of the Science industry. Key events such as the WISE Awards, provide excellent opportunities to share knowledge and ideas with many likeminded companies, organisations and individuals in both the business and academic world. For the Wise Award Categories & 2013 Shortlist click here. Congratulations to everyone who has been nominated for a WISE award this year, we wish you all the best of luck. We look forward to celebrating with you at this this fantastic event next month. The 2013 IRP Awards will take place 3rd December at the London Marriott Hotel Grosvenor Square and will be hosted by the Newsnight presenter, Jeremy Vine.